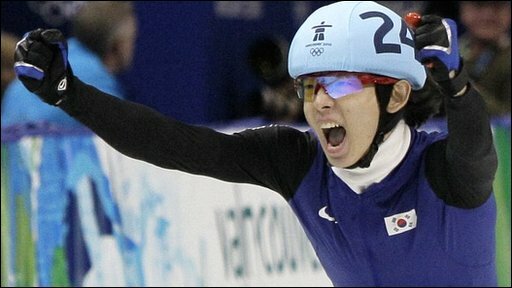 Jung-Su Lee of South Korea clinched a dramatic Olympic gold medal in the men's 1,500m short track. Lee grabbed gold ahead of American duo Apolo Anton Ohno and JR Celski in a time of two minutes 17.611 seconds. It was all to play for going into the final bend but a crash involving Korean pair Ho-Suk Lee and Si-Bak Sung opened the path for Lee to take victory. For Ohno it was his sixth Olympic medal, making him the most successful short track skater of all time. Ohno has also equalled Bonnie Blair as the most decorated United States Winter Olympian. The 27-year-old was 0.365sec behind Lee with Celski coming home in a time of 2:18.053. Canadian Olivier Jean was back in fourth and earlier his compatriot Charles Hamelin, the world number two, won the B final to come eighth overall. Lee said he planned before the race to set off fast and stay out of trouble. "I wanted to raise the bar high right at the beginning so I could feel more comfortable during the rest of the race," said Lee. British teenager Jack Whelbourne bowed out at the semi-final stage having come through a dramatic race in heat four, claiming the third and qualifying position after a crash floored two of his rivals. Whelbourne, 18, led his semi-final in the early laps but then saw Lee Ho-Suk turn the race into a procession on his way to the final, Whelbourne finishing fifth. His team-mate Anthony Douglas finished fourth in heat six.